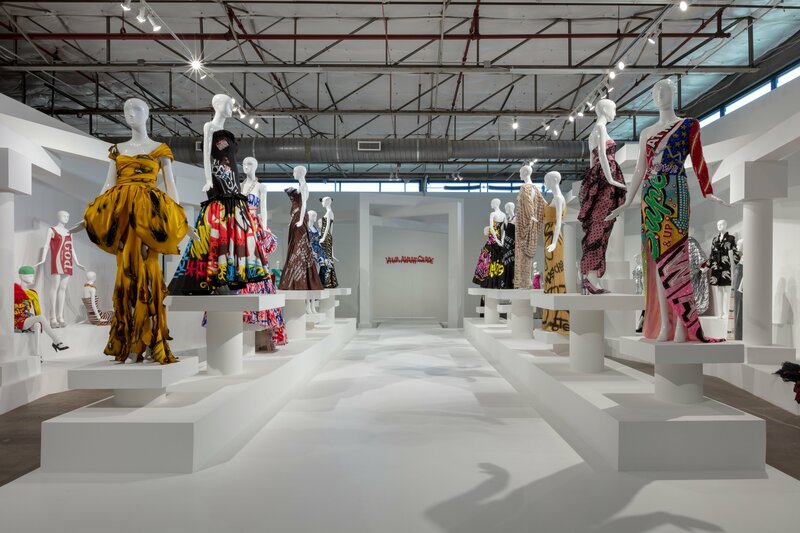 Jeremy Scott, Installation View of “VIVA AVANT GARDE: A Jeremy Scott Retrospective” at Dallas Contemporary, 2019. Courtesy of Dallas Contemporary. Photo by Kevin Todora. Dallas area museums have welcomed a rich crop of fashion exhibitions in the past few years: Iris van Herpen’s wearable sculpture at the DMA; Mary Katrantzou’s explosively colorful prints at Dallas Contemporary; Balenciaga’s painstaking construction at the Kimbell. 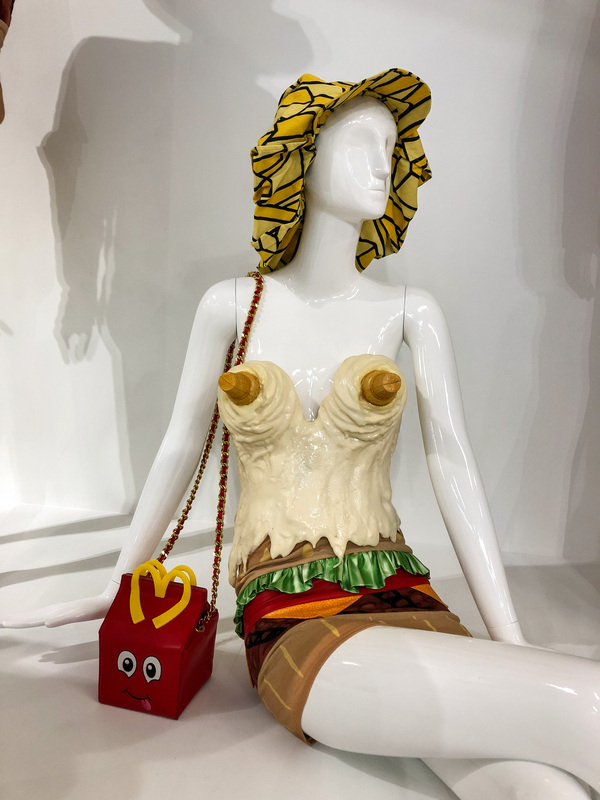 So, it shouldn’t be surprising that a retrospective of American fashion designer Jeremy Scott popped up at Dallas Contemporary this month. But Scott isn’t like those artists – he’s not a brilliant designer in any traditional sense of the word. He’s pedestrian compared to van Herpen, vulgar compared to Balenciaga, and completely lacking in any restraint. Ironically, that’s exactly what has launched him into the canon of American fashion greats, and into the driver’s seat of one of Milan’s most daring fashion houses. Jeremy Scott’s designs, both for his namesake label and for Moschino, are crazy. And who doesn’t want to see that? Viva Avant Garde: A Jeremy Scott Retrospective dominates the left half of the museum with a frozen parade of mannequins dressed in rhinestones, leather, sequins, and tulle. There are about 70 items of clothing, shoes, handbags, and accessories from Scott’s repertoire, including collaborations with brands like Adidas. They’re positioned on and around a winding runway, inviting viewers to strut along and take a closer look. Follow the scorched satin gowns past the body-sized gym sock and around the corner from the straitjacket bride and you’ll find a small chapel-like space, complete with a shrine to Jeremy. His plaster bust sports a mullet and a gun-adorned chain. This image is a good indicator of Scott’s design ethos: perverting classicism, toying with iconography, and daring people to get offended. It might not work if he wasn’t so playful about it. Scott has long been known as a provocateur – “Fashion’s Last Rebel,” was how the New York Times put it in 2011 – for both the absurdity of his designs and the devil-may-care attitude behind them. Many times, the heavy inspiration of pop culture in his designs has veered towards imitation. He’s been sued by artists and designers like Rime and Jimbo Phillips, and accused by many others. 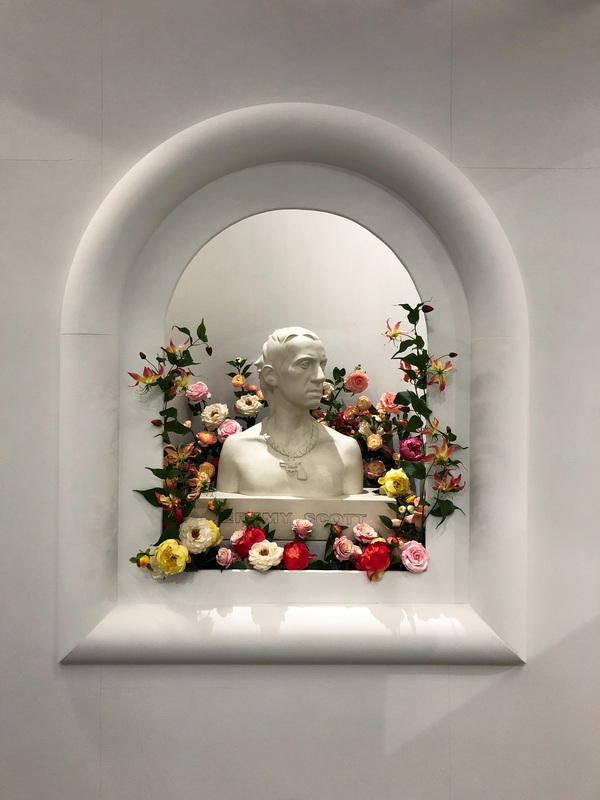 Earlier this month, the popular Instagram account Diet Prada pointed out the glaring similarities between the Moschino Pre-Fall 2019 collection and Gucci’s Resort 2019 show. Yet, it seems almost fitting that a designer so obsessed with icons and kitsch would not only produce, but reproduce imagery. He is, when it comes down to it, a pop artist. While Jeremy Scott may tap into fellow designers for inspiration every now and then, it’s undeniable that he’s created a distinct vision, and extreme is the best way to describe it. That’s how he, at only 43 years old, has produced enough insanity to fill an entire retrospective at Dallas’ most fashionable museum. The clothes–from the ice cream cone bra to the mini dress printed with the word “God” to the flower girls wrapped in cellophane–are worth looking at. Like it or not, they’ll probably make you look twice.